Working larger than usual, this was done on 12 x 15.5" Clairefontaine Ingres/Pastel White Laid Paper. I have absolutely fallen in love with this paper for all things marker, pen & ink. 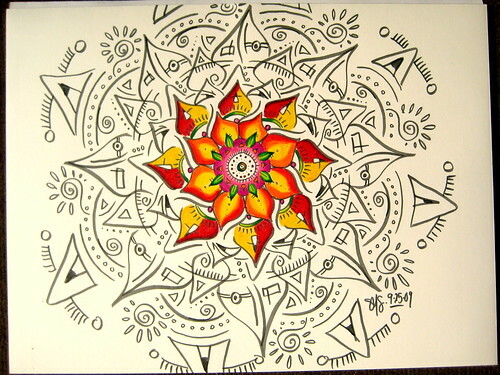 This time I first outlined the mandala with a Faber Castell Pitt Artist Brush Pen. I then used watercolor paints in the center, but was a bit disappointed at how they came out. It wasn't bad, but it wasn't great either. This isn't a paper that's designed to be used with water but ironically, a similar laid paper (but in a heavier weight) made at Clairefontaine's Schut Mills in the Netherlands is used in the Exacompta Sketchbook and that paper does seem to take watercolor paint better than this lighter paper which is designed for pastel use. Deciding that the center color wasn't up to my standards, I colored over the watercolor with colored pencils. Forgive me, but I can't remember which. I think it was regular Prismacolor. Your "lack of patience" for filling in the designs with color might be a good thing: why not publish a book of your mandalas in black and white for others to color? This could be useful for adults testing colors, inks, and combinations thereof--and a whole lot of fun and learning for kids.